I think I had this salad for lunch EVERY DAY last week. Not this exact salad, but a version of it. 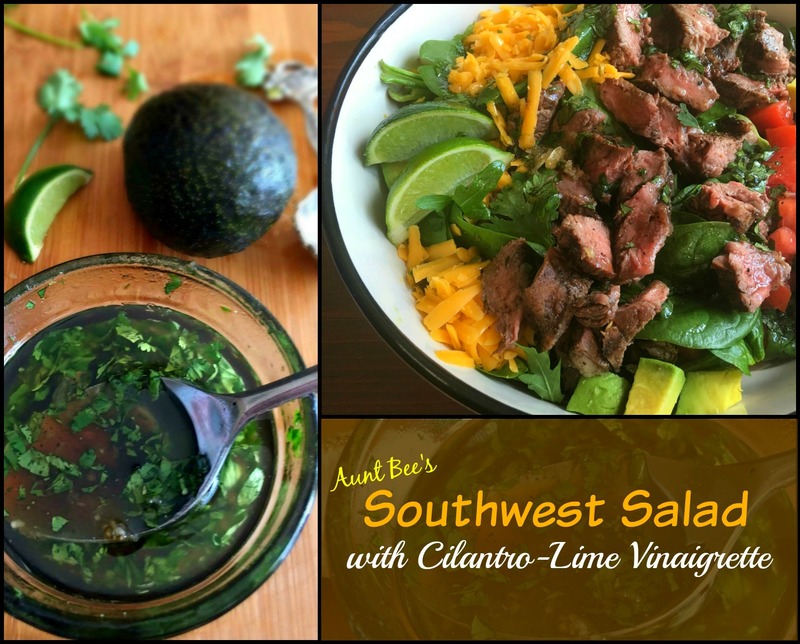 The salad is pretty much just whatever Mexican/Southwest mix ins you love or have on hand. It’s delicious, but believe me, it is ALL about this dressing. After the 3rd or 4th time I ate it last week, I decided that things between us ->me & this salad<– may be getting serious and it was high time I blogged about it and quit keeping it all to myself. So I snapped a pic and then got sidelined by a heel spur and never got around to blogging it for you! Forgive me! -leftover chicken or steak fajita meat, with sauteed peppers, onions & lots of colby jack cheese. -Sliced chicken or steak with corn, black beans, avocado & cheese. -The day I snapped the pic I just threw in some steak, tomatoes, avocado, & cheese and YOU GUYS! You just can not go wrong with this salad & dressing. 2) Have a DELICIOUS homemade dressing on hand for salads or dipping. I am in no way, shape, or form a food snob but I detest bottled dressing. This vinaigrette is my new fave and I can’t wait for you all to try it! Combine all ingredients in a bowl and whisk until incorporated. Add salt & pepper to taste.